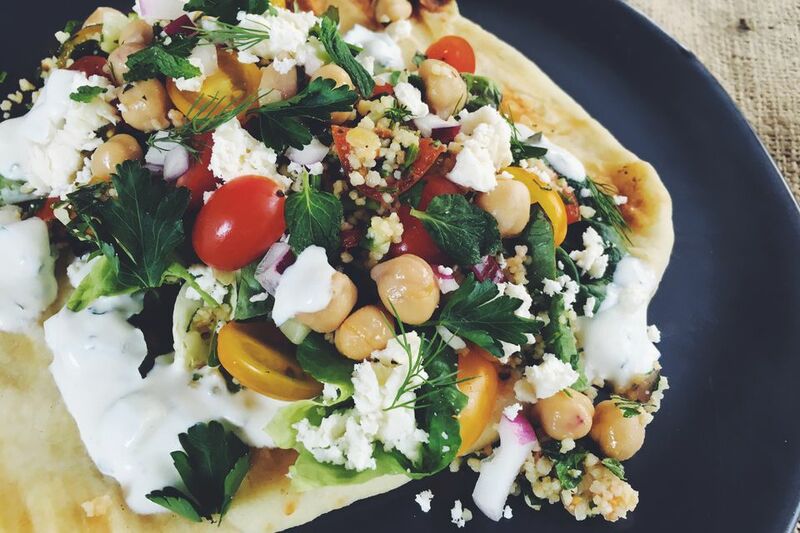 This Middle Eastern vegetarian pita sandwich is stuffed with homemade tzatziki, homemade tabbouleh, feta cheese, fresh vegetables and a lot of fresh herbs. Craving something with a little bit of heat? Try this spicy Middle Eastern hot sauce made with harissa, garlic and tomato paste. Note: while there are multiple steps to this recipe, this vegetarian pita dish is broken down into workable categories to help you better plan for preparation and cooking. In a small bowl, add greek yogurt, chopped cucumber, grated red onion, chopped fresh mint, chopped fresh dill, the juice from half lemon, 1 tablespoon olive oil, and salt. Stir to combine all the ingredients completely. If the sauce is too thick, add 1/2 tablespoon of water at a time until desired texture is reached. Add bulgur wheat, scallions, parsley, mint, tomato, cucumber, olive oil and lemon juice (starting with half a lemon) to a small bowl and mix. Salt to taste. The flavor of the tabbouleh will get better as it sits so be sure to let it rest for at least 30 minutes before serving. Heat the pita in a microwave or in a saute pan on the stove until it's soft and pliable. Add tzatziki to the center and top with lettuce, cherry tomatoes, red onion, tabbouleh, feta cheese, mint, parsley, and dill. Serve immediately.